Hmm, so, Darth Horn-Rimmed, those who would become your apprentice in the dark art of paper sales, these people are, hmm? With the job market so poor, less goofy-looking candidates you could find, I would think. Hmm, yes. Anyway, asked to provide a task for you people I have been. At first, overjoyed at this prospect I was. But, then informed I was that just use you to paint my house and mow my lawn, I can not! So lame that is. In my opinion, a fine test of your business skills, washing and detailing my air speeder would be. But able to think outside of the box, this Primatech seems not to be. So, a more business-oriented task I have for you. Appointed as head of the Dagobah Tourism Council, I have been. Want this job, I did not. That I was signing up for Tuesday night line dancing at the Senior Center, I thought. But the other sheet on the bulletin board that was. So stuck with the job now, I am. At least until trick another doofus into taking the job, I can. Easy, I thought this job would be. But out it turns that to Dagobah, almost no tourists come! Puzzled by this I am. Want to spend their spring break at a planet that is 100% swamp land and is completely crawling with snakes, who would not? Sure, many ways a person can die on Dagobah, there are. But keep tourists from flocking to Planet Florida, that does not. Such a mystery. Hmm, yes. But, few customers I have had. Yes, a nice retirement community on Dagobah, there is. But very tight with their money, old people are. If more tourists we have, more suckers potential customers I will have. 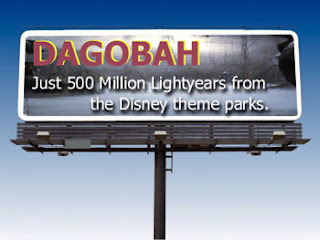 So, your task this is: design an effective advertising campaign to draw tourists to Dagobah. A few different parts this task has. Not acceptable - "We guarantee your ship won't get permanently stuck in one of our bogs!" Acceptable - "Once you come, you may never leave!" Hee hee! See what I did there, do you? So clever, I am. Hee hee! So, anyway, clever like that you must be. Besides, to the Dark Side, lying leads. But only to the Beige Side, tricking people leads. Live with that, you can, I am sure. Judged on your creativity, humor, and effectiveness in manipulating unsuspecting tourists, your efforts will be. Maybe judge you based on your relative body odor, I will, too. On how many beers I have had when the time comes, that depends. Got it? Good. Now pick your Project Managers and start to work. You have until Friday at midnight (EST Earth time) to finish the task. 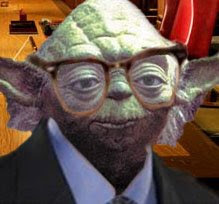 Thanks to Mr. Yoda for agreeing to give us his time on this task. Grateful, we are. Oh yeah I got this one. I know the answer to the problem. Hey Koma ---- wanna wrassle???? If mistaken I am not, the answer to every problem, mud wrestling is. It does help you have an Anti-Venom Hut in every hundred miles. Long time no see, Master Yoda. Good to see you back. 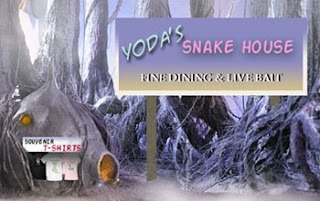 Stop by for some snake stew some time, you must. A special recipe with lizard broth I use, now. That extra lizardy flavor it gives the stew. Even pack an extra bowl for you to take home with you, I will.